Need Carpet Cleaning in Lynden? We all know that carpets get dirty. You and your family walk on them all day long, and they often catch spills from daily life. If you have pets or you wear your shoes inside, then you have everything from the outdoors–from dirt to feces–on your carpets as well. That’s pretty gross, and you probably should get those cleaned so your family can enjoy clean carpets! Luckily, John’s Chem-Dry of Whatcom County is here in Lynden to take care of your carpets. We’re experts at cleaning all types of carpets, including area rugs. Our friendly technicians are excited to clean your carpets for you and your family so you can enjoy your clean home sooner. How Does Our Carpet Cleaning Work? At John’s Chem-Dry of Whatcom County in Lynden, WA, we utilize the natural deep-cleaning power of carbonation to clean your carpets better than other methods. This carbonation provides a powerful reaction deep within carpets to clean them at the base and lift dirt and grime to the surface of the carpet fibers. Then, our powerful yet gentle extraction machine whisks the dirt and grime away from your carpets for good. Our advanced carpet cleaning solution will leave your carpets cleaner and drier than other carpet cleaning options in the Lynden area. Learn more in the video. We pride ourselves on offering the healthiest carpet cleaning in Lynden. How? First, we never use any harsh chemicals during our cleaning process. Since the carbonated bubbles work safely and gently for us, we don’t have to use any soapy chemicals that damage the carpets and the environment. Often soaps can leave behind a sticky residue that can attract dirt and grime in the future, making them get dirtier faster. Not our cleaning solution! Second, because our cleaning solutions are specially formulated, we are able to leave your carpets with a deeper clean without needing as much water. Forget about waiting for hours and days for your carpets to be completely dry. Our process has a quick dry time, allowing you to get back to your daily life sooner. 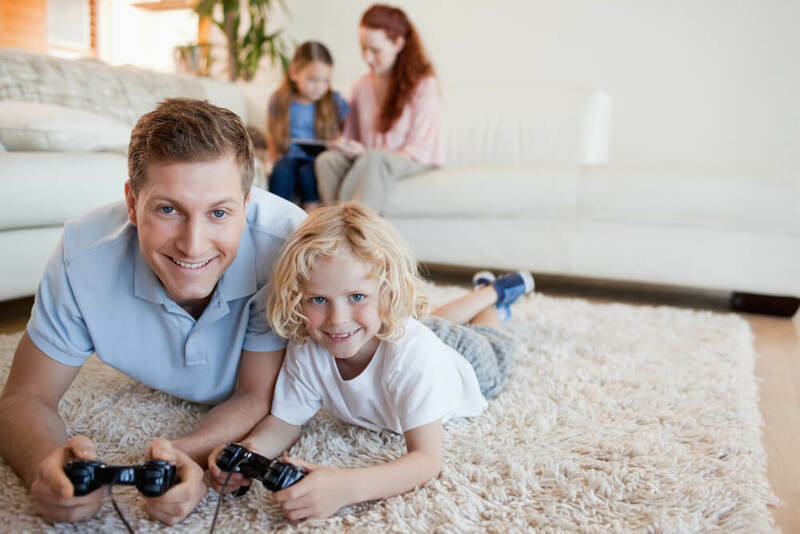 At the same time, quick dry times also help prevent the growth of mold and mildew underneath your carpet, leaving a healthier home environment for your family to enjoy. Of course, we realize a great cleaning company needs more than just a powerful cleaning solution. We also work our hardest to provide a customer experience that is friendly and easy for you. Our aim is to be the preferred carpet cleaners in Lynden with helpful technicians and efficient carpet cleaning methods. We truly enjoy being able to help you have a happier, healthier home and we do our best to convey that during your cleaning appointment by being friendly and efficient during the cleaning process. Our friendly staff serves Whatcom County, including Everson, Point Roberts, Lummi Island, Sumas, Ferndale, Bellingham, and Blaine area. We also offer upholstery cleaning in Lynden. Please browse our site for more answers about our non-toxic Green Certification, our other services (such as upholstery and tile cleaning), and our cleaning tips! John did a fantastic job, and went above and beyond what I expected. Thank you, John!